Mushroom cutlets are quick and easy to prepare. I have added oats to make it more nutritious. 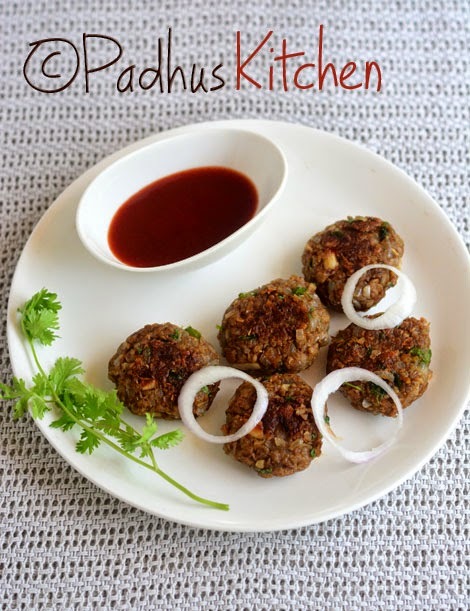 These cutlets are very tasty, healthy and perfect for a tea time snack. You can also serve this cutlet in a burger or on a sandwich or even as a side dish with rice. Today we will learn how to make simple mushroom cutlets following this easy recipe with step wise pictures. Clean the mushrooms and chop it. Chop onions, green chilli and garlic finely. Grind together all the ingredients mentioned under grinding. (mushrooms, garlic, green chilli, chilli powder, pepper powder + milk)- (see picture of ground paste below). Heat oil in a pan, add finely chopped onions, green chilli and garlic. Saute until onions turn transparent. Add chilli powder, salt needed and the ground mushroom paste. Cook on medium heat for a few minutes. Then add oats, finely chopped coriander leaves and cook for a further 2-3 minutes. Remove from heat and leave it to cool. Divide the mixture equally. Form each part into a ball and then flatten it to make round shaped patties. If the mixture is too dry, you can add little milk. If the mixture is too wet, add more oats. Grease tawa with oil and heat it. Place the patties on the heated tawa and drizzle 1-2 tsp of oil around the patties. Cook for a few minutes on low heat and flip it over to the other side. Drizzle another 2 tsp of oil on the other side and fry the cutlets until brown on both sides. Serve hot with ketchup. It is a great accompaniment with your evening cup of tea. Enjoy!! Thank you for this as I am going to make it tonight for dinner. Love your blog. I tried this receipe today but my patties have turned up so soft otherwise it tasted well. Yes, you can coat the patties with bread crumbs. Can we do without oats or any suggestion instead of oats? You can use bread crumbs instead of oats. Can we use leaf mushroom instead of button mushroom? ?